Welcome to the Rutland Chapter website. All our latest news is listed on this page, and more information about the Chapter is presented on the About Us page. Detailed information about rides etc. is presented on the members only pages - you will need to register to access these pages - see the tips page for details. All you need to join us is a Harley, what are you waiting for? The second of our Saturday Socials, a chance to meet up with Chapter members and friends. From 12.30 onwards at the Dealership in Uppingham. Click here to download the membership form (new members and renewals). 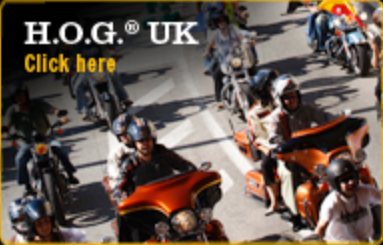 Once completed, please return the form to The Membership Officer H.O.G.® Rutland Chapter, c/o Sycamore Harley-Davidson® North Street, Uppingham, Rutland, LE15 9RN. Our Membership Secretary can be contacted via the "Committee Page". Chapter merchandise can be purchased from the dealership in Uppingham. We have large and small HOG Eagle patches. large and small Rutland Chapter rockers and a variety of other pins, patches, baseball caps etc.